Amphibians are an important component of the global ecosystem, as indicators of environmental health and contributors to human health. They watched the dinosaurs come and go, but today almost half of them are themselves threatened with extinction. Addressing the amphibian extinction crisis represents the greatest species conservation challenge in the history of humanity. The global conservation community has formulated a response in the Amphibian Conservation Action Plan, and an integral part of that response is the Amphibian Ark, in which select species that would otherwise go extinct will be maintained in captivity until they can be secured in the wild. Without immediate captive management as a stopgap component of an integrated conservation effort, hundreds of species could become extinct. Addressing the amphibian extinction crisis represents the greatest species conservation challenge in the history of humanity. One third to one half of all amphibian species are threatened with extinction, with probably more than 120 already gone in recent years. The IUCN Global Amphibian Assessment has alerted us to the fact that hundreds of species face threats that cannot be mitigated in the wild, they require zoos to save them in the short term until adequate conservation measures to secure wild populations can be developed. Comparable calls to action are included in other IUCN documents. The World Association of Zoos and Aquariums (WAZA) has joined with two branches of the IUCN Species Survival Commission (IUCN/SSC) – the Conservation Breeding Specialist Group (CBSG) and the Amphibian Specialist Group (ASG) – to form the Amphibian Ark (AArk). 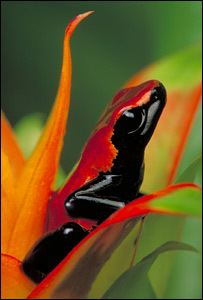 Since 2006 the Amphibian Ark has been helping the ex situ community to address the captive components of the Amphibian Conservation Action Plan, saving as many species as possible by providing global coordination, technical guidance, training, necessary linkages to other IUCN groups, communications, and guiding publicity and capital campaigns. Without immediate captive management as a stopgap component of an integrated conservation effort, hundreds of species will become extinct. This conservation challenge is one that we, the ex situ community, are uniquely capable of addressing. Never before has the conservation community at large charged zoos and aquariums with a task of this magnitude. This is an opportunity for every zoo and aquarium, regardless of size, to make a vital conservation contribution, and for our community to be broadly acknowledged as a credible conservation partner. Supporting this call to action is clearly within the financial capacity of all zoos and aquariums, and engages the diverse expertise found within all institutions. Our goal is 100% participation of WAZA zoos and aquariums and the regional associations. If we do not respond immediately and on an unprecedented scale, much of an entire vertebrate class will be lost, and we will have failed in our most basic conservation mission as defined in the World Zoo and Aquarium Conservation Strategy. And there is so much that can be gained from studying these little guys. I hope it is not too late.